Do you have a passion for Ayrshire & Arran? Do you want to make a positive difference to your local area? Ayrshire and Arran Tourism Team are seeking passionate local people to create memorable visitor experiences in the region! Could you direct visitors, provide information; offer to take photographs, welcome groups or even pipe in the Waverley? If so, you could be a Tourism Champion Volunteer! We provide training, support and tourism team kit! 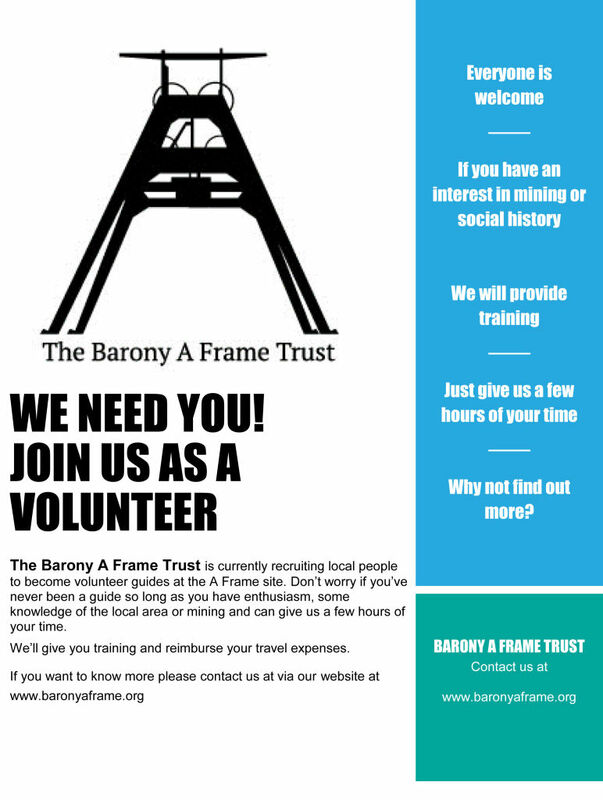 The Barony a Frame Trust is sending out a message to the local community ‘We Need You’. ‘We want local people, particularly those with a connection to mining or with an interest in the local community to volunteer as guides at the site so that they can pass on their knowledge and stories to visitors,’ says Barney Menzies, Chair of the Trust. The Trust is currently carrying out works on the site to clear an area of derelict land and connect the A Frame to the surrounding footpath network. As part of this project the Trust is keen to involve local people as guides to show visitors or school groups around the site and talk about their experiences of mining or local culture. The Trust will be working in conjunction with local organisations – CVO and the Volunteer Centre – to provide appropriate training for all volunteers. As part of its strategy for sustaining the A Frame site, the Barony A Frame Trust is embarking on what it hopes will be a two phase programme of development works on land adjacent to the A Frame. Over the last two years the Trust has carried out consultation exercises and a feasibility study to find out what local people wanted to see at the site. The resounding response was that they wanted to see outdoor activities and improved access to the surrounding countryside. On that basis the Trust put together a long-term plan to provide a footpath link to the existing footpath network, additional interpretation materials, a cycle track and a group of volunteer guides. The first phase of the project, funded by the Minerals Trust and Ayrshire LEADER is already underway. This includes the footpath connection and interpretation materials onsite plus the training of a group of volunteers. The primary aim of the project is to increase use of the site and ensure the future of the A Frame. In addition the Trust wants to provide opportunities for the local community to engage with visitors as volunteers and pass on their knowledge of the area. Volunteers will be trained in a range of skills which may lead to long term employment. Visitors to the Barony A Frame site will know that the car park at the site has been closed to vehicle access. The closure is due to additional works onsite to create a footpath link from the A Frame to the local footpath network. Over the past year the Barony A Frame Trust has conducted consultation events and a feasibility study to find out what developments local people wanted to see at the site. As a result the Trust applied to a range of funders for money to carry out works to deliver an ambitious two stage project which includes the footpath connection. ‘Phase one of the works is fully funded,’ says Barney. ‘We’re still waiting to hear about funding for phase two of the works. The second stage of the project involves extensive additions such as a cycle track, tree planting and additional interpretation at the site.’ The project is a direct response to individuals who indicated that opportunities to access the countryside and the footpath network were required. ‘Many local people visit the A Frame as a starting point for a walk in the countryside. The Trust wanted to improve access to the footpath network from the site as well as provide additional opportunities for outdoor activities such as cycling,’ adds Barney.